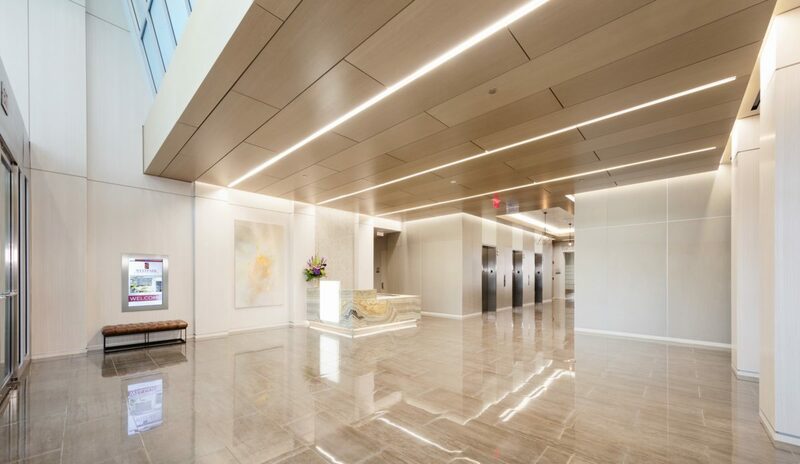 KANE Construction, Inc., (Gaithersburg, MD) recently completed a high-end Lobby renovation at 8484 Westpark Drive in Tysons, Virginia. The two buildings at WestPark Corporate Center were completed in the year 2000 and comprise 470,000 square feet of Class-A Office Space owned by Northwest Mutual. The $1 Million project was designed by Hickok Cole Architects (www.hickokcole.com), an award winning Washington, DC based design firm and project management was directed by JLL (www.us.jll.com). Initial demolition of all of the existing wall, floor and ceiling finishes was completed before the installation of three different types of Atlas Concorde floor tiles from Italy for the main lobby, vestibule, and exterior courtyard. The walls, doors, and ceilings were covered in custom Tabu Tay Koto veneered wood panels, also from Italy. Crossville porcelain wall tile and Forms+Surfaces glass headers were used in the elevator lobby. The ONYX Greige polished marble reception desk, was highlighted by a custom LED panel and hidden lights in the base. Major tenants in the buildings include NADA, Immix Group, Dell Federal Head Quarters, and First Savings Mortgage. KANE constructed the job during business hours making it a challenge to keep the lobby open to the public throughout the renovation. Exact phasing and trade coordination along with long-lead items and a tight schedule added to the complexity of the job. 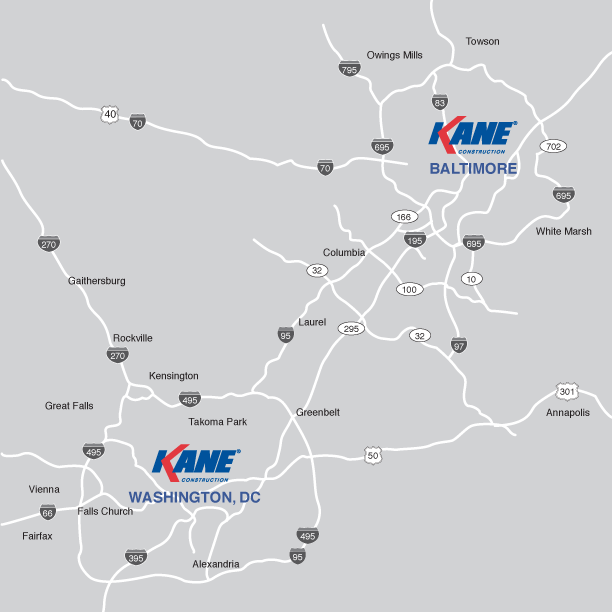 KANE Construction, Inc. specializes in commercial building renovations and tenant interiors in the Baltimore and Washington, DC metropolitan areas. 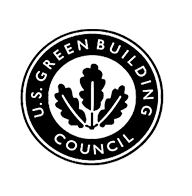 Founded in 1997 by Dennis O. Kane, the firm is consistently ranked as one of the Top 25 Interior Construction Companies by various industry publications. Clients include national real estate management firms, Fortune 500 corporations, prominent medical, life science and research institutions, trade associations, law firms, associations and high-end commercial office tenants. Your team performed as promised and proved more than capable at navigating the many obstacles inherent in fast track construction. The quality of work, expediency, and the customer service were simply top-notch. At every turn, the KANE team has delivered consistent value to our projects through their dedicated staff and high quality work product. From start to finish, KANE Construction delivered all and more than you promised. Because of your team’s diligence and excellent professional can-do attitude, our team was able to move in on time as promised. The quality of your team’s work and commitment to getting everything just right is indeed a rare quality in today’s work environment. with a KANE Project Manager and get budget pricing. Copyright © KANE Construction, Inc. All rights reserved.